Well, it isn't totally 100% the way I would like it to be yet, but it is well along. I do have several more articles from my old site to convert to .pdf format and post. In addition, one of the big things I have left to do is to get this blog integrated into the website either by a) integrating the current Blogger structure into the new site with a subdomain or b) ditching Blogger and going with WordPress, which is apparently far easier to integrate into a website and has a function that allows you to migrate old Blogger posts into the new Wordpress site (yikes, 4 years worth of posts....will that really work correctly and without a hitch? ), though doing that apparently leads to a loss of Google ranking and SEO gains that have occurred over the years. Anytime one undertakes a project such as this, there is a huge amount of consideration given to the viewer experience. However, it is sometimes easy to be surprised at the fact that viewers don't necessarily agree with your opinion, and in the end it is only the viewer/visitors opinion that counts. People with different backgrounds and interests will surely have different ways of looking at a site. With that in mind I would like to invite any readers over to my new site to have a look. It would REALLY be appreciated if you could make helpful and constructive comments about it on the blog or e-mail me directly. Nice comments are good but constructive criticism is even better. 1)Is the navigation bar and site navigation in general easy and intuitive? 2) Are the images to big to comfortably view/enjoy? 3) Does the color scheme seem too bland or does it need to be spiced up in some way? 4) Are the gallery slideshows taking too long to load and are they of a good size for viewing? Are the instructions for the slideshow buttons clear? Is using and viewing the slideshows intuitive? 5) I put a fair amount of effort into making "Story Behind The Image" pages for each image that viewers can get to by clicking on any picture in the slideshow. Once one of these "Story" pages are pulled up, you can either return to the slideshow or navigate the gallery from these pages. Is that clear from the website? Are these pages easy to get to? Are the "Story" pages worthwhile? 6) Given that a webmaster, graphics non-professional (me) coded it, does the site have a generally professional feel to it.....or does it scream amateur? (I still have the old site available if folks feel the current site is lacking). 7) Any comments or experiences to relay on achieving blog integration within a website? While you are there, if you have an interest in signing up for the Newsletter I am planning for two or three times a year you can sign up from the site directly at this page. As people who read this blog may know from my prior posts, I have undertaken the rather hefty project of designing my own website rather than continuing to use my current on-line template model where I simply upload my images to a service. I am currently deep into the project, which seems to be moving along at a faster pace than I thought it would (my self imposed deadline for going live is April). I want to make the site a springboard that I can use to offer many types of media going forward, such as pdf format articles, e-books, maybe some video etc, but am also trying to figure out ways to make the traditional presentation of images more interesting. In this regard, I am looking for opinions and was hoping some blog readers might offer up theirs. I am going to be presenting my portfolios/images in slideshow format with a full screen option as well as the option to choose individual slides rather than just let them play. What I was considering was an option whereby clicking on a slideshow image would bring the viewer to a page with a large version of the image at the top as well as text describing the "Story Behind The Image", which could include items such as the location as well as the specifics about the situation that was occurring when I took the image such as what attracted me to the image, how difficult it was to access the site, what it was like to be there and the like. Do you think this type of information helps establish a 'dialogue' with the viewer and allows them to become more involved with the image or is it simply personal information ("I did this or that") that a viewer would really not be all that interested in? Opinions would really help me out......my inclination is that it would make the site a bit more different, but it would take extra work that I am willing to put in if it is a feature that viewers would be interested in as opposed to personal narrative that no one really cares about? If you care to offer an opinion on this simply put it in the comment section or feel free to e-mail me directly. It goes without saying that a photographer needs a website to share his or her work with the world. Many years ago, I had coded a website using a program called Namo Web Editor. It was, in my opinion, a reasonable site for that era but was a bit difficult to update and I found myself not adding to it as much as I would have liked. Some years later, I purchased a template for an artist's website with plans to build my site based on that template. However, I found that the template contained so many options that I was going into the code to eliminate or change these options and that I was likewise changing code to allow more images to be posted to the galleries. The exercise became frustrating and I abandoned it. I ended up moving my website over to Visual Server with one of their online artist's templates, forcing my vision into their options. This has served reasonably well, but I still find myself wanting more from a website and have been thinking about building my own, from scratch, by learning how to use Dreamweaver. I know that, given time limitations, it might take awhile to complete the project and thought that I would, intermittently, write some posts about the process. My initial step is to think carefully about what I want out of a website and what is not being provided by my current host, while trying to incorporate 'best practices' for a new site. 1) First and foremost, I believe it is important to keep it simple and clean looking. Flashy with lots of bells and whistles might be useful for some type of sites, but I believe that for a photo site the images, and not the platter on which they are served up, should be what speak . Additionally, a lot of fancy add-ons don't necessarily function well on all platforms. 2) Easy navigation. I dislike when I get to some sites and I can't figure out what to do next. 3) Set it up so that it will look good on multiple platforms and screen resolutions, to the extent that this is possible. 4) Able to be easily updated. 5) Because of the frequency and consistency of my blog posting, my blog has more visits and has higher Alexa rankings than my website. I would like to be able to integrate my blog into my website. I am not certain if this is still easier to do with WordPress than Blogger, though I know this used to be the case. 6) Have the ability to make PDF files available for download. 7) Have the ability to add on audio and video files should I wish to make these available in the future. 8) I believe that telling 'the story' behind the photograph helps viewers to become involved with an image and would like to have an opportunity to present 'the stories', in brief, along with the images. This is likely going to be a slow moving and long term undertaking. I would certainly appreciate any comments, tips, ideas etc from those that have already worked through this type of website building project! We have all had occasions when we see what would make a great image but, unfortunately, don't have a camera. An image lost forever......but is it?? With his incredible descriptions the image can be clearly seen in our mind if not on paper. Perhaps the image is not lost. Though I had programmed my website on my own, and was generally pretty pleased with it, the site had the drawback of being difficult to update. An art site is not particularly helpful if it tends to stagnate and isn't updated with one's new work. To alleviate this problem, I had been working on programming a new site that would automate some functions, but this was taking far more time than I had planned. Not happy with how things were going, I decided that it would be more effective to use a 'hosted solution' to the problem. In short, I felt the best use of my limited time was not to spend it concentrating on website design. After looking at various companies and their solutions to the problem, I decided to go with Visual Server. It doesn't have much in terms of fancy bells and whistles (though they seem to be making relatively frequent updates, the most recent of which includes an easy way to add a shopping cart to the site) but the templates are clean and easy to use. The template setup has also led me to think of my images in a more project oriented fashion. They put the focus of the site squarely on the artwork, which is where it should be. Though a bit on the pricy side, Visual Server is owned by Photo-Eye, so I also feel that at least I am supporting an art-centric organization. My old URL (www.hgrillphotographic.com) redirects to the new site. However, people had a difficult time remembering that web address and so I now have a new domain. The new site can be found at http://www.howardgrill.com. I made the site live as of about a week ago, and am still working on getting it just the way I want it. Not all my work is up yet, as I am still working on assembling the images into portfolios. Nonetheless, if anyone takes the opportunity to visit, I would love to hear what you think. The folks at TinEye apparently saw that I had put up a blog post about them. As a result, they gave me twenty pre-approved invitations to give out to join their beta website. I will send them to the first twenty people that respond to this post by making a comment that they want one. In the comment you can leave your e-mail address and name, or, if you would rather not do that, you can e-mail me with your name and e-mail address. I do, however, request that you put a comment in the blog first so that people will see when the twenty invites have been given away (twenty comments) and not continue to fill my in-box with requests long after the invitations are gone. Then again, perhaps I am overestimating what the popularity of the site will be. Well, no matter. If twenty people are interested, just post a comment and let me know your e-mail address. If there are already twenty comments....well, that's it! Deep down, we all love Photoshop. But, sometimes, things can go a bit awry. With photography that generally means that we have ended up in the trap of oversaturation or poor contrast. In the field of graphic design things can get worse......much worse! How much worse and how often? Turns out quite frequently. And not only work by amateurs....as you will see many of these bloopers are in ads put out by very large corporations. The errors, sometimes small, sometimes big, and very frequently funny have a place where they go for all to see and that place is a blog called Photoshop Disasters. Check it out here and know that others have erred far worse than you! Ever wonder if any of your images are online, be it pilfered from you or being used with permission. I ran across a very cool search engine which aspires to be the Google for images. You simply give it the URL of the image or, even easier, right click on any internet image after installing a Firefox plug-in and the site searches for the image, or even a portion of the image, in cyberspace. 1) At this point in time only a small fraction of the images 'out there' are cataloged and searched.....about 500 million of them. 2) It is still in beta. 3) To try to use it you need to apply for an invitation. The good news is that I got mine via e-mail in about 10 minutes. 4) It didn't find my images on various critique sites where I know they reside. But within limits it does work. If you go to a microstock site, where images are meant to be purchased for use, and search on a popular image it will return hits where the image has been used, even when the image has been cropped down etc. Try it for some of your own on-line images. You might be surprised what you find, for better or worse! 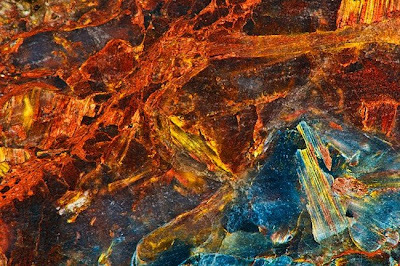 For the last month or two, fellow blogger and photographer Mark Graf has intermittently written in his blog about photographing rock samples, particularly Pietersite, as part of his 'Inspired By Stone' project. Ever since seeing the images he has posted as part of this project I have simply been mesmerized by them as well. I am equally amazed by the concept of how many beautiful compositions can be found within just a few square inches. Mark talks a bit about how he made the photographs here. I think I might have to give this a try myself. From His Blog "Notes From The Woods"
Have a look at his rock, shell, and wood abstract gallery here. The images are truly beautiful and open up a world that few take a close enough look at. I recently ran across an interesting photography blog with a different twist than most I have mentioned here. As opposed to being primarily art related, Photopreneur is a blog dedicated to discussing various ways that one's images can be used to produce income. Whether or not this is of primary interest, I find the blog well thought out and the articles interesting and full of good ideas. I thought it was worth sharing. I think having a peek at Photopreneur is worthwhile, and, who knows, it might give you some interesting ideas! I recently ran across an amazing set of portraits by photographer Mark Story, taken as part of his project entitled "Living In Three Centuries: The Face Of Age". His project started as an effort to photograph people who, because of living extraordinarily hard lives, appeared worn and aged beyond their years. It ultimately morphed into photographing those who have lived during three centuries, the centenarians and 'super-centenarians', whose life has encompassed the end of the 1800's, the 1900's, and,now, the new millennium. I find it interesting that the original idea of photographing those that appear worn beyond their years ultimately turned into making portraits of those who have lived longer than most of us can hope to. The portraits are haunting and extremely expressive. They are accompanied by fascinating text that tells the viewer a bit about the subject. Well worth having a look. Once you are there, I bet you stay awhile, as I found myself somewhat mesmerized going through the images and reading about each person. Mark Story's website can be found here. It is worth taking time to read about the project before going right to the images. By the way, "Motivation" was one year old yesterday. When I started this blog, I wasn't quite sure how long it would last or where it would take me. Now, 156 posts in and going strong, I am very glad that I undertook it and am particularly thankful for the opportunity to have 'met' a good number of people who have contacted me along the way. It has also served to 'motivate' me to continue my photographic journey. I hope you have found it of some use as well.